In 2011 fourteen acres of land on Nibley Knoll was purchased after an appeal to North Nibley residents and members of the public. This land is now owned by The Knoll Trust. 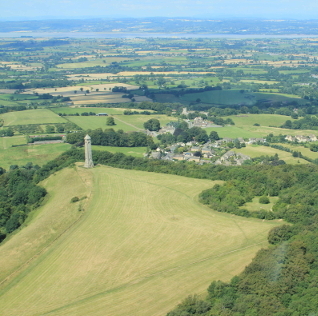 Together with land already owned by the Parish Council and The Monument Trust this means that in all twenty acres of the open land on the top of Nibley Knoll is in some form of public ownership. The three owners are working in partnership to manage the land for the benefit of the public. The main intention is to keep the land as it is, clear of scrub and hospitable to native wild flowers, birds and insects. The designation of the land is 'unimproved grassland'. In order to maintain it in this state it will be necessary to fence it, prevent the encroachment of trees and brambles etc and to cut and remove the grass once a year after the native flowers have seeded. The whole area will be open to walkers and for picnics and the general enjoyment of residents and visitors. The Knoll Trust have already removed some of the trees in order to give a view out to the West and North. It is planned to trim back more trees in the future in order to restore the view to pre 1960 levels. If this is successful then it will be possible to erect seats for walkers to rest and enjoy the view. These improvements aim to keep it a special place for everyone to enjoy. The sides of the hill had become very overgrown over the last few years with trees and brambles encroaching on what was unimproved grassland. The decision was taken to clear some of the trees as when we were collecting donations to purchase the Knoll land we were regularly asked, "When would Nibley get it's view of the monument back?". By this they mean when will the whole of the monument be visible from the village as it used to be? This has definitely improved the view. The Trust's contractor has strived to create as little interruption to the use of the Knoll as possible for which we are grateful! The current phase of work has now been completed and users of the Knoll will be able to enjoy the improved view from what is undoubtedly a very special place! Once the land has been cleared down to the boundary, new fencing, gates and stiles are planned. 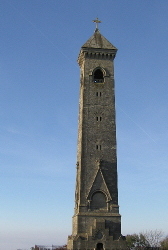 The area around the monument will be cleared again during the Autumn and winter by volunteers. The grass has also been cut. It is desirable to control the grass by grazing cattle but this has not been possible so far. As an alternative we would hope to be able to cut and remove the grass after the wild flowers have seeded. The grassland habitat at Nibley Knoll is a scarce resource locally and nationally. It is a shallow, dry natured soil over oolitic limestone and supports a community of plants, insects and birds which are either scarce or in national decline. It is open high level grassland, open to the west and receives sun, wind and rain in fair measure. It borders Nibley quarry, another once environmentally rich but now largely ruined natural habitat, which once supported eight or nine scarce orchid species and many other plants and insects. The quarry habitat is now mostly ruined due to unrestricted use by mountain bikes which have trashed every part of the quarry. It would be a shame (figuratively and literally) if the same fate befell the grassland by overuse from horses, dogs, mountain bikes and motorcycles. This area of grassland is now in the care of and for the community and so does not need to be economically farmed or commercially exploited for profit and so can be managed for both people and the natural environment. With a plan of marginal scrub management, zero fertiliser and weedkiller, late cutting and collection of the meadow grass after the wild flower seeds have set, and limited follow-on grazing with a low density of cattle or sheep, this relatively small area of upland grassland habitat could be returned and retained as a local stronghold (and therefore a source) of insects, birds and wild flowers. Notable bird species which currently try to use the area for nesting are Skylarks (a sadly declining species in England) and Meadow Pipit (locally declining from lack of breeding habitat). Neither of these species can nest successfully if the grassland is walked through to any great extent by people, horses or dogs in the spring to early summer, but will none-the-less attempt to breed and fail. Simply keeping to the couple of footpaths and bridleway is good enough. Skylarks will sit tight for example even if a nest is closely approached provided the bird knows it has not been seen. Decent grassland management (and it does need to be managed, or it will revert to scrubland) will also benefit many species of butterfly which use the wild plants as food plants for their larvae and for nectaring. notably Green Hairstreak, Skippers, Clouded Yellow, Brimstone, Green-veined, Wood and Small Whites, a variety of Blue butterflies, Speckled Wood, Red Admiral, Painted Lady, Small Tortoiseshell, various Fratillaries, Marbled White and a number of Brown butterfly species all use either the grassland plants or the shrubby bushes at the woodland edge as larval food plants. Of particular interest on this grassland used to be the large colony of Fireflies (Glowworms) which, on a recent beacon night, the local children were so fascinated by! It also supports a good colony of Cinnabar Moths which use the summer flowering Ragwort, a much maligned but essential summer flowering food plant for late insect hatches, and very many other moth species. The flower population will increase significantly with a little care and minimal management, and this can already be seen by the increase in Cowslips, a plant which used to be oh so common just fifty years ago but now is largely restricted to motorway verges where it has been reintroduced. Given just half a chance, nature will fight back and recolonise these small but essential areas. We should give it that chance. The quarry is truly being trashed. The area where Twayblades grew in quantity is now mostly a path with a few of these enigmatic orchids growing at the side and some pushing up in the new path. The spotted orchids are now scarce where before they were common. I saw one Green Hairstreak .... just about hanging on. It was built in honour of William Tyndale, the translator of the New Testament and much of the Old Testament, who is believed to have been born at North Nibley. The tower was constructed in 1866 and is 111 ft (34 m) tall. It is possible to enter and climb to the top of the tower, up a spiral staircase of about 120 steps. A further wild plant survey was carried out for us by Clare and Mark Kitchen in Spring 2016. The following additional plants were found by Clare and Mark. Recently a wild plant survey has been carried out for us by Clare and Mark Kitchen. The following plants were found. Clare and Mark have kindly agreed to do a further survey in Spring or Summer 2016. This is an important geological locality showing a thick section of Lower and Middle Jurassic rocks, spanning the junction between the Aalenian and Bajocian Stages. The lowest stratum visible is the Cotswold Sand Formation of the Upper Lias, exposed in the sunken lane cuttings. Above is a thick section of the 'Cephalopod bed', the topmost of the Aalenian Stage, here similar to that at Wotton Hill. The Lower Inferior Oolite Freestones, of early Bajocian age, are capped by an excellent example of a 'hardground', a thin layer of tough limestone encrusted with fossil mollusc shells, formed when environmental changes caused deposition of the limestones to slow down or cease altogether. Above the Freestone lies the Upper 'Trigonia' Grit of the Upper Inferior Oolite of which this is one of the best and most fossiliferous sections. The Middle Inferior Oolite is entirely absent here, clearly demonstrating the effects of an important phase of uplift and warping of the earth's crust during the Lower Bajocian. In combination with the presence of the hardground at the top of the underlying Freestones this provides one of the best illustrations in the Cotswolds of the effects of this important phase of earth movement. It is now two years since, with YOUR help, we achieved the acquisition of the fourteen acres of land at Nibley Knoll for the public to enjoy. We have set up the Knoll Trust with five Directors: Robert Maxwell, Roger Holcombe, Tim Hodsman, Ken Brown and Chris Burns-Cox. As you know the main reason for acquiring the Knoll is to protect it for public enjoyment, and we applied to Natural England to enter the land into a conservation scheme to enable us to have an income to manage the Knoll. Finally we have achieved this. The Government Grant is a useful contribution towards the cost of the work needed in the short term. In addition, as a result of the response to the original appeal and the reclaim of Gift Aid, where it was available to us, we have enough cash in hand for the forseeable future. To clarify a few points: the Trust owns fourteen acres of land but there are also another 5.6 acres owned by the Parish Council. Both areas of land are entered into the same scheme. there are also other grants available to help with the management of the Knoll for example for stiles, gates, fencing, clearing scrub etc. There was a very heavy infestation of ragwort which Natural England was keen to control as it was overtaking the rare species of plants present there. With the help of generous and energetic local people the ragwort has been pulled and taken away to be burnt for 2 years. However this was not enough to make a significant impact and so on the advice of natural England we had it spot sprayed earlier this year. While collecting the donations the most frequent comment was that the view to the North of the Knoll was blocked by a few trees growing to a higher level. We have been making extensive enquiries into the ownerhip of the small piece of woodland that is blocking the view. These enquiries are ongoing and we will update you when we have made any progress. We were delighted to mark the Queen's Diamond Jubilee by planting an oak tree on the Knoll and the children from North Nibley C. of E. School planted a time capsule at the same time. This report is just to let you know waht has been happening. Having spoken to a few donors, most feel an annual report in this form is sufficient. If, however, you feel you would like a meeting we are quite happy to arrange one, though obviously there is a cost involved in hiring the hall and finding a date to suit all is never easy!! The acquisition of this land was a wonderful achievement especially given the short time we had available and we hope you continue to enjoy it. If you have queries or concerns about the Knoll land, do please get in touch with us (Robert Maxwell and Ken Brown). Natural England is the non-departmental public body of the UK government responsible for ensuring that England's natural environment, including its land, flora and fauna, freshwater and marine environments, geology and soils, are protected and improved. It also has a responsibility to help people enjoy, understand and access the natural environment. It has been severely criticised recently for ignoring scientific data and granting extended badger cull licenses to DEFRA. It was formed by the amalgamation of three bodies (Countryside Agency, English Nature & Rural Development Service). An opportunity has arisen for the community to purchase 14 acres of land on Nibley Knoll near the Tyndale Monument. The present owner has always allowed unhindered enjoyment of this land an we would like to ensure that this is the case for future generations. We plan to form a Trust to raise the purchase price of £45,000 plus legal costs to keep the hill in its natural state to be enjoyed by all. CAN YOU HELP? We have one month to raise the required amount so if you would like to be part of this great acquisition with a contribution, large or small, please contact: Robert Maxwell or ken Brown for more details. All enquiries will be dealt with in the strictest confidence. Our main intention is to keep the hill as it is. The present owner has allowed unhindered enjoyment of the land and we have been very fortunate in this. We now have the opportunity to purchase, and asked the agent to give us a month to raise the money to which he agreed. We are hoping to obtain conservation grants to fund the management of the land. Our main concern is that if a private purchaser buys the land the use of the hill could be for something not compatible with the beauty of the Knoll and the enjoyment of the village residents and wider community. Moreover, a new owner might well be much less generous about access. It is hoped wild flower areas could be established. As the land is not fertile as some there will not be such competition from vigorous grasses. The boundaries need some attention. At the moment, motorbikes are using the hill which is not compatible with other users, walkers, dog owners, cycle riders, horse riders etc. We are very keen to work in close contact with the parish Council and the Monument Trust who have a joint interest in the Knoll. Any kind donations will ensure the whole of the Knoll is held in public ownership to be enjoyed by everyone for ever. People travel from far and wide to walk to the Knoll and the Monument so please inform your friends and visitors. This is not just an appeal to Nibley people! It is a large sum of money to raise in a short period and we appeal to you generosity and your goodwill to preserve the Knoll as it is. We're enormously encouraged by the progress so far, and are confident that the total can be reached. Accordingly, we are in progress of setting up a public, non-profit entity to own and manage the land. As soon as this is done, and the total reached, we will let everyone know, so that money can be collected, and the purchase made. Please contact, to make a pledge or for more enquiries Robert Maxwell, Tim Hodsman, Roger Holcombe, Ken Brown ALL ENQUIRIES WILL BE DEALT WITH IN THE STRICTEST CONFIDENCE. A bank Account has been opened and we are now beginning to turn pledges into definite donations. As yet we are unable to produce a Gift Aid from for those who are tax payers until the Charity Commissioners have dotted the "i's" and crossed the "t's", but this can be done afterwards by those who wish and we will let you know when we have them. We are waiting for the legal side of things to be negotiated, and then hopefully the purchase can be completed. Cheques can now be accepted and made out to NIBLEY KNOLL. Please feel free to contact Robert Maxwell, Roger Holcombe, Ken Brown or Tim Hodsman This is an unbelievable achievement and we are extremely grateful to all who have made pledges so that we are nearly ready to attain our goal.... to ensure the Knoll can be enjoyed by everyone forever. NIBLEY KNOLL APPEAL.... WE'RE MOVING FORWARD!! NIBLEY KNOLL.... WE'VE DONE IT!!!!! CONGRATULATIONS !!!!! The purchase of the land around the Monument has now been completed. 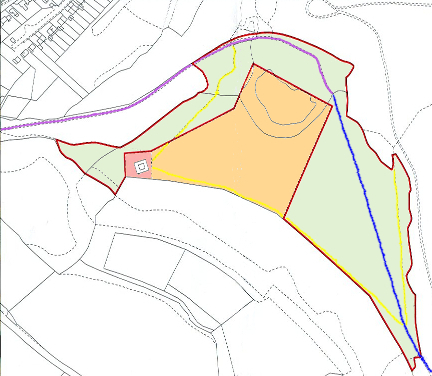 This means that the 20 acres of land on the Knoll is all in public ownership. Grateful thanks to all who contributed to achieve this. Volunteers were recruited for a ragwort pulling session the following week which proved very successful. The Knoll land and the Parish Council land, in all about 20 acres was cleared of ragwort in about 1.5 hours. Many hands made light work!!! A celebration procession was held on 4th September when over 100 people ascended to the top with picnics, dogs and horses! 4WD vehicles were on hand to take those unable to climb up and some who had never made it to the top before. The weather was beautiful, home-made cakes provided, & the afternoon enjoyed by all! Suggestions have been made to make this an annual event..... What do YOU think???? I've speculated before that in educating the children of today, schools have to look to the past, to understand from where we have come, and to the future, in order that they may fulfil their potential as confident individuals, successful learners and responsible citizens in a modern age. Last week the children had the chance to do both - at the same time! On Friday 2nd March the children of North Nibley School joined members of the Parish Council and the Knoll Trust to plant an oak tree on land adjoining Tyndale's Monument to celebrate the Queen's Diamond Jubilee. This was one of the first of many events in the area to mark the occasion. Every child in the school climbed the Knoll and watched as the tree was planted. Parents, staff, school governors and other members of the community came to watch. Tilly and Harvey, the oldest and youngest pupils at the school, helped to pack down the soil around the base of the tree. A map of the school. A letter from the Head Teacher and. The children then speculated how life might change in the next 60 years. What food might they eat? How might they get about? What music gadgets would be all the rage? Finally they wondered if they will be present when the capsule is unearthed. Time will tell!! What a great evening we had on Monday 4 June on Nibley Knoll! A big Thank You goes to Ken & Roly Brown, Dave Purnell and Iain Devine. As a result of their hard work and efforts a large number of parishioners and visitors were able to get up to the Knoll and enjoy a dry and warm evening watching the Beacon being lit to patriotic singing. I reckon there were well in excess of 300 people (some say 341) on Nibley Knoll to witness the lighting of the Beacon. Well done to all those involved. I know that Ken and the Knoll Trustees are interested in having further events on the Knoll. They want to make it feel like the Knoll belongs to the village. So if you have any ideas for future events please let the Trustees know. You may have noticed some activity near the monument over the winter of 2014/2015. A group of volunteers from North Nibley have been clearing scrub on the end of Nibley Knoll. The land which is owned by the Monument Trust and The Knoll Trust has become very overgrown over the last few years with trees and brambles creeping up the hill. Some older residents may remember when the hill could be seen from the village. 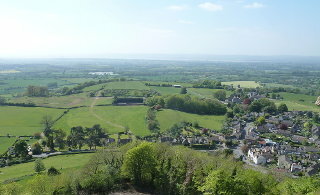 The aim of the project is to restore the view of the hill and also the views from the Knoll across the Severn Vale. This aim will not be achieved in a single year. Whilst we have made considerable progress in removing small trees, cutting back medium size trees and cutting down brambles and nettles, there are still large trees to tackle. Once the hill has been cleared it will be necessary to keep new growth under control by regular strimming etc. Recently contractors for the Knoll Trust have also been clearing trees and undergrowth from the monument to the Quarry. Once these areas have been cleared we all hope that rare plants that once grew on these slopes will return and flourish.